1) STOP LOOKING FOR A PUPPY. The classic mistake puppy buyers make is saying “I need a Havanese breed puppy at the beginning of summer” or whatever it may be. So they go out looking for litters due in August. 2) INTRODUCE YOURSELF THOROUGHLY. The initial e-mail should be several paragraphs long; block out at least an hour of quiet for the first phone call. 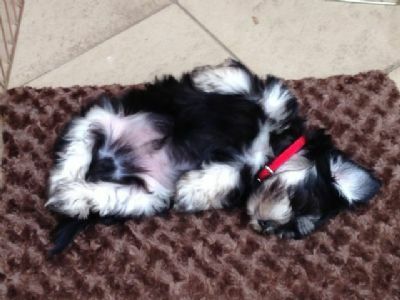 When you initiate contact, clearly communicate three things: You are ready for a puppy, you are ready for a Havanese puppy, and you understand what sets this breeder apart from the others and you share that commitment. Specifically describe your plans for this puppy; be truthful. If you are not going to be able to go to four training classes a year, SAY SO. Don’t say “Of course, training is a huge priority around here,” or you’re going to end up with a puppy who’s flushing your toilet sixty times a day because he’s so bored and you’re not challenging him. 2a) Bring up price either at the end of the first contact (if it’s been successful and you feel a connection to this person) or in a follow-up contact. It’s nice to say “If you don’t mind me asking, about how much are your Havanese puppies? I just want to be prepared.” The breeder will usually give you two pieces of useful information: Her price, and the median prices around you. That way, if you decide to go a different way, you know about what to expect. If the second person you contact names a price that’s double the median, try to discreetly find out why. A very difficult pregnancy, nationally ranked parents, a surgical AI, c-section resulting in very few live puppies, full health testing with supporting documentation, those are some reasons a breeder could be asking more and it’s reasonable. If there’s no real difference from the other breeders except price, think carefully. 4) PLEASE DO NOT GET ON MORE THAN ONE WAITING LIST unless you are VERY honest about it. This goes back to rule 1. You need to understand that we think our puppy buyers are just as in love with the puppies as we are. We’re posting pictures, writing up instructions, burning CDs, researching everything from pedigrees to nail grinding, all so we can hand off this puppy, this supreme glorious creature of wonderfulness, with the absolute maximum chance that it will lead a fabulous life with you, and we’ve built all kinds of air castles in our heads about how happy this puppy will be, and what it will do in its life with you, and so on. Finding out that you had your name on four lists shows that you don’t realize that puppies are not packages of lunch meat, where getting one from a David Jones is basically the same as getting one from Go Low. What you are seeing is not reality. You are seeing the most outgoing puppy, or you’ve fallen in love with the one that has the most white, or the one that has a different look from the rest of the litter (when I had one chocolate girl puppy in a litter of black boys, every human that came in the house wanted her; when I had one red boy puppy in a litter of black and tan girls everyone kept talking about how much they loved HIM), or the one that’s been (accidentally) featured the most in the pictures I’ve posted. Or, sometimes, you have a very good instinctive eye and you’re picking the puppy that’s the best put together of the litter. And that puppy, of course, is mine, and you’re going to have to pry him out of my cold dead hands. My responsibility is not to make you happy. My responsibility is to the BREED first. That’s why my first priority in placing puppies is the show owners, because they are the ones that will (if all goes well) use this dog to keep the breed going. It’s not that I like them better than I like you; it’s that I have to be extremely careful who I place with them so that they can make breeding decisions with the very best genetic material I can hand them. My second responsibility is to the PUPPY. I will place each puppy where I feel that it has the best chance of success and the optimal environment to thrive. And I make sympathetic noises and take you off. If, then, you decide you want to get a different puppy, be my guest. Just keep me appraised and let me close off my commitment to you before you open it with another breeder. And we will take your name in vain, Horace Green from Mildura, and Jill will feel bad that she sold you a puppy, and oh the bad words we will say. And Horace Green from Mildura will be a topic of conversation at the next Nationals, and t-shirts will be made that say “DON’T BE A HORACE,” and someone will name their puppy Horrible Horace and everyone will get the joke and laugh. written by Joanna Kimball but every word is how Kerris Havanese feel about our precious Havanese and their new family.